Classes take place weekly in Sheffield, South Yorkshire on Mondays (8.15-9.30pm) in Ranmoor and Wednesdays (7-8.15pm) at Hunter's Bar. You can enjoy an empowering blend of gentle flowing sequences to release tension with targeted posture work to increase muscle tone, and powerful relaxations to de-stress the mind. This is mindfulness in motion. 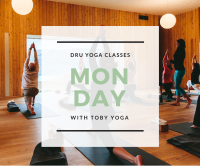 And the fantastic thing about Dru Yoga is that it is suitable for all ages and abilities. I have been practising Dru Yoga for almost two decades and qualified as a teacher in 2016. Having experienced the wonderful impact Dru Yoga has had on my life, I am passionate about sharing the experience with others. My body is much more flexible, my stress levels have dramatically reduced and I sleep far more soundly. What's not to love about that! classes are £10 on an individual basis but only £9 if you pay for a block of five or more sessions at once.